I love how you belted the jacket! I would have never thought of doing that, but it looks really cute! Love the bright colors on skirt! I love the combination of leather and and blue shade…amazing! I adore your shoes and dress ! Such an amazing look, love how the blue-ish colours complement well the dark/ leather items!! lovely! Great outfit! Love your purse! absolutely gorgeous!!! The colors are stunning!!! You look stunning once again! lately your blog is one of my biggest inspiration! I can’t live without my leather coat. I like the dress vert much, and also the bangle. Lovely dress! and I really like tha fact that you used a belt on the jacket, so original! Really nice outfit!Love the dress! The Missoni dress is beautiful! Amazing outfit! I love the print of that skirt :)! Very cute, I totally love the leather!!! I’m super in love with your dress! I love your dress and bag! Great outfit!! I love this outfit! The accent colors are amazing with the lovely black leather coat. Very nicely styled! Love how you added some color with skirt and belt,gorgeous coat! Love the outfit! You look fabulous! Gorgeous, gorgeous, gorgeous. Specifically LOVE that bracelet. preciosa falda..ahh quiero una asi!! besos linda!! i actually love the blue belt and all the hints of color! Wow! Stunning! I love your skirt. Fantastic outfit love your dres is beautiful kiss. 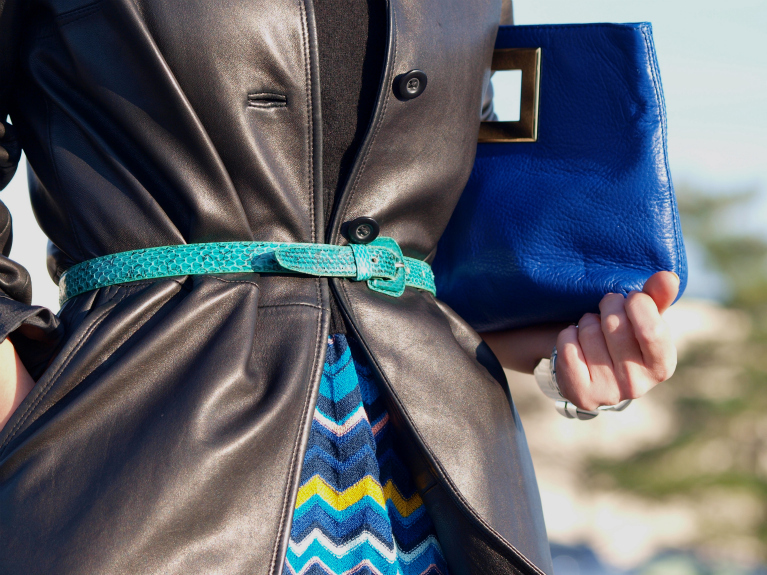 Adding a skinny colorful belt is definitely a beautiful way to accentuate your slim waist! You look amazing! Leather coat and shoes look so chic! amazing outfit!! I love it! This is an impeccable look. Your dress is fabulous ! I love this look! So amazing with the skirt and the bag! Veronica,another gorgeous leather trench coat,i’m jelous! kisses! my best friend has that missoni for target dress…. great colors! Excellent color insert in the dark shades! This is a totally stunning look, my dear. I have a dress something like the one in the images. Pairing it with leather make for a certain awesomeness . . . Absolutely love this outfit! The strong colours against the strong texture of the leather is so striking, and you look beautiful! wonderful look, my sweet friend! kisses to you from the cold germany. Amazing outfit!! and you always so beautiful!!! I love the skirt and the bright pops of color you added with your accessories! Stunning! That Dress is to die for!!! I love your dress. Kisses. Seriously this outfit is amazing!!! very beautiful and complete dear!! I’m waiting you, I have a new post! I love your outfit it’s so cool & chic! wow I love this outfit!! especially the skirt. I just found your blog – I really like it so far, & you have great style! Wow, I have to say you rock every outfit. Wonderful look, love how you used the bright color belt over the leather coat. It so chic!! Beautiful look Veronica, I love so much Missoni dress and the way u accentuated coat with the belt!! Beautiful as always Veronica!! So in love with the colors and textures!!! There is blogger in Israel that looks very similar to you. You have to take a look at her!!! This is absolutely stunning. Love the leather! oh and I just clicked through our outfits, they are wonderful! I’m a new follower via bloglovin! clutch and colorful details, are fabulous! This is such a cute look–I adore the thin bright belt against the black leather. Hello Darling, I love your posts. Fantastic photos, and incredible style.